Slightly sweet, slightly salty, and totally crunchy, PopCorners make a delicious breading for my gluten-free Kettle Corn Crusted Chicken Tenders. It's an easy, kid-friendly dinner! I just received my latest Degustabox, a surprise subscription food box company based in Barcelona. They've recently launched in the United States and I'm lucky enough to receive my very own box of goodies. If you follow us on Instagram, you've already had a sneak peek at what I found in this month's box. Of all the tasty foods in my Degustabox, I decided to make a recipe using one of my son's favorite special treats: Carnival Kettle PopCorners. This is the snack my son requests if we're hosting a special playdate or a movie night. Of course, I admit that I'm also a sucker for the slightly sweet, slightly salty flavor of this crunchy snack. I thought the Carnival Kettle PopCorners would make a great, crispy breading for chicken fingers. These popped corn chips are gluten-free, made with non-GMO ingredients, and taste amazing. There's just a hint of sweetness and a hint of saltiness so the chips are just perfectly salty-sweet. Although my family isn't gluten-free, we do have friends—both kids and adults—who are; these Kettle Corn Crusted Chicken Tenders are a great option for them. *I use this gluten-free baking mix, it makes for a light and crispy coating. Dredge each chicken strip in flour and shake off excess, then dip it in beaten egg, then in the PopCorners crumbs. Turn each chicken tender to coat fully. Transfer to a large plate and repeat with the remaining chicken tenders. Throw out any leftover flour, egg, or crumbs. In a large skillet over medium to medium-high heat, add ghee and oil. Once the ghee melts, add the chicken tenders. Do not crowd the pan; you may have to work in batches. Cook, turning one time, until chicken is golden brown on each side and is cooked through, about 8-10 minutes total. If you'd like, sprinkle some additional salt on top of the Kettle Corn Crusted Chicken Tenders while they're hot. I served my Kettle Corn Crusted Chicken Tenders with honey mustard for dipping; it has a similar savory-and-sweet flavor profile to the chicken. But you can use any dipping sauce you like! If you're interested in trying Degustabox, check out their website or follow them on Instagram. If you sign up to receive your own Degustabox through one of our links, I'll receive a referral fee and you'll help to support this blog! This chicken looks delicious. Crispy and flavorful. Who wouldn't love it? What a brilliant idea! I would have never thought of doing this! Your chicken tenders sound fabulous! I agree with Michelle, this was a superb idea to use them for breading! This chicken would be great at a tailgating party spread! So fun and flavorful! And, that Chipotle Fried Egg Avocado Toast looks amazing! I must try that! Kettle Corn is the perfect crunch topping for chicken! I would have never thought of this clever idea. Now I can't wait to give it a try! I love this idea! These chicken tenders look so crispy and delicious! Oh Justine!! This is such a great idea!! I loved this months box and never would have thought to use the snack this way!!! This is so clever!! Just love it -- off to check out that box!! Such an awesome idea!! We were introduced to Corn crisps a couple of months ago and we absolutely love them! 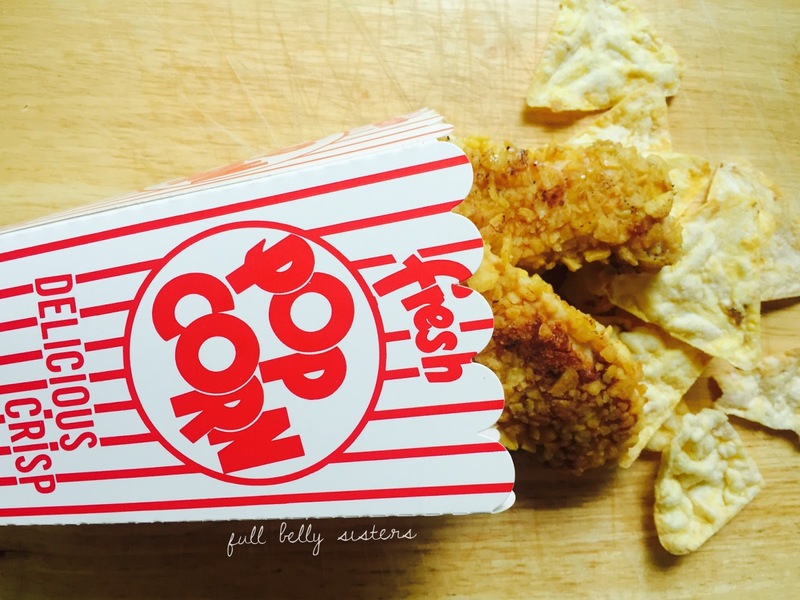 I love crunchy chicken tenders and these are great for the kids. The sweet and salty combination from the pop corners kettle corn is great!